We’re still redoing our kitchen. There is an end in sight, at this point…however…sometimes projects lead to more projects. So while the kitchen cabinets are just about finished and our counter will be installed this week, our kitchen project has lead to a “paint the entire living area project” as well as a “lay all new floors in the house project” and also a “buy new curtains project”. Then I decided that with all the new floor and new wall and new kitchen business, we might need a new dining room table. Because you can’t really enjoy the newness of everything else while staring at a kitchen table that has kool-aid rings and Sharpie doodles on it. It kinda ruins everything. And really, if we get a new kitchen table, we kind of need a new coffee table in the family room. But with a new coffee table, you need new end tables. And seriously, you can’t have new end tables without new couches. But my husband doesn’t feel the same way. He doesn’t understand how bad our couches will feel. They’ll miss the kool-aid rings and Sharpie doodles. I don’t want my couches to feel abandoned. And I certainly don’t want my kool-aid rings pulling a Toy Story on me and trying to find a way back to the house. So basically I made cupcakes to soften the husband up to the idea of Extreme Home Makeover: DIY edition. While he loved the cupcakes, he pretended he went deaf during the whole “buy new everything” conversation. Temporary deafness apparently is a thing. We’re going to the doctor next week. Are you going to miss seeing my sweet plywood counter tops in pictures? 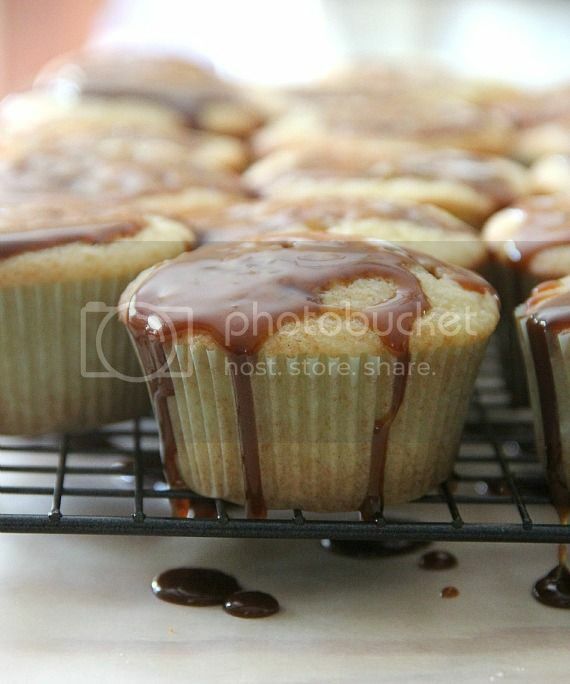 Here’s the deal with these cupcakes It starts with caramel sauce. Wait, come back! Don’t run scared…you can do it, I promise. This is the world’s most foolproof caramel sauce ever. And it’s for-sure easier than unwrapping all those pre-made caramels, I swear it. Just melt some butter, milk,and dark and light brown sugar together. Then boil it. For just 3 minutes. That’s totally it. It will seem too runny, but I promise you, as it cools off it will thicken. Patience, grasshopper. While you’re waiting to prove me wrong, bake your cupcakes. Fill the liners about 3/4 full. While they are cooling you’ll need to make your frosting. This is where you’ll need some of the cooled caramel you made…just butter, powdered sugar, caramel and milk. Then poke some holes in the tops of your cupcakes. You could stop there, really, but you made frosting, remember? Just frost them a little, sprinkle with sea salt and drizzle with more caramel. Could a cupcake be more gorgeous? You will have about 3/4 cup of caramel left…which is only a problem if you’re an alien. 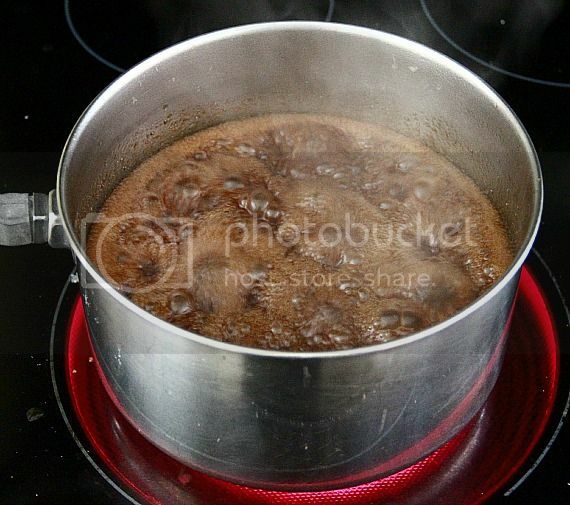 In a large saucepan over medium heat, melt butter and light and dark brown sugars, and milk together. Bring to a boil. Let mixture boil for 3 minutes. Remove from heat and let cool. In a separate bowl combine flour, baking powder and salt. Whisk together. 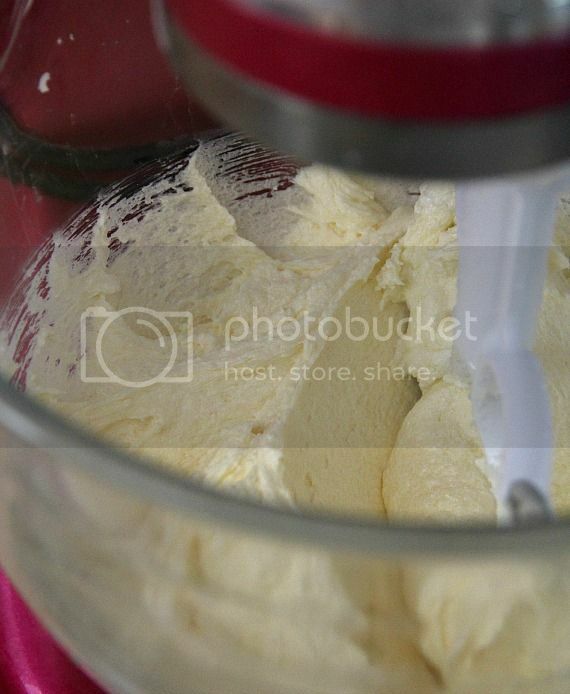 In mixing bowl, beat butter and sugar over medium speed for 3 minutes. Add eggs and vanilla and continue beating until combined, scraping the sides of the bowl when necessary. Add the flour and the milk, beating on low speed until ingredients are just combined. Fill each liner about 3/4 full, about 1/4 cup batter. Bake approx 20 minutes until centers are set. Transfer to wire rack and let cool for 10 minutes. While cupcakes are cooling make your frosting. Combine butter, powdered sugar 3/4 cup prepared (and cooled) caramel sauce and milk in a mixing bowl. Beat ingredients together about 2 minutes until creamy. 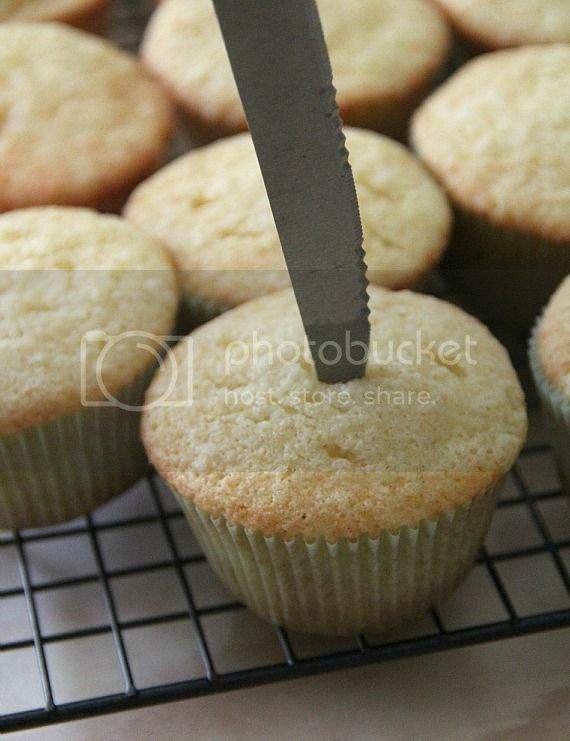 After cupcakes have cooled for about 10 minutes, pierce tops of cupcakes with a sharp knife or skewer about 10 times. 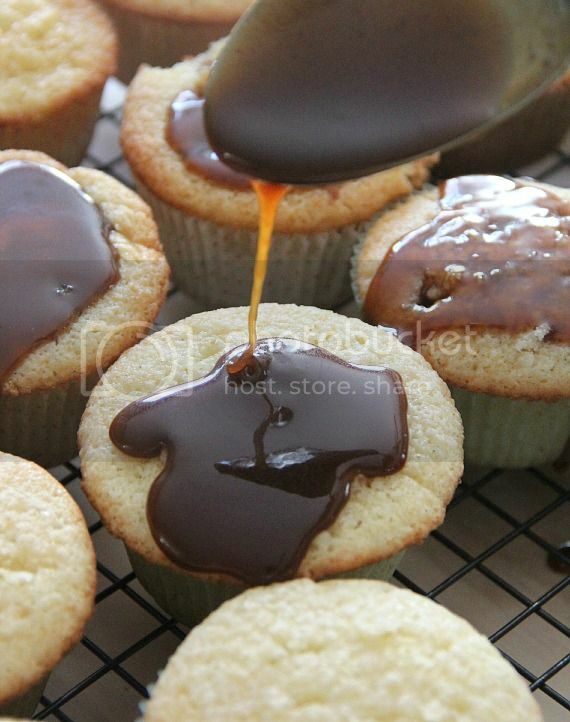 Pour about 1 tablespoon of caramel sauce on top of each cupcake, allowing it to absorb into the holes. Let the cupcakes finish cooling completely and then frost with about 2 tablespoons of frosting on each. 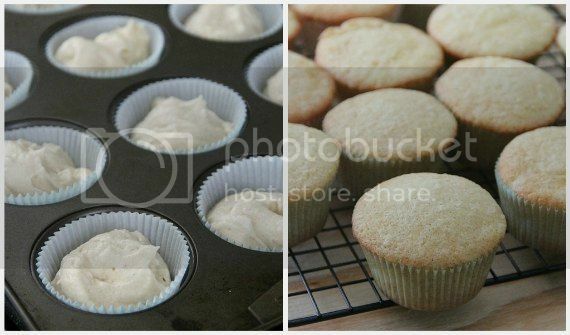 Lightly sprinkle your cupcakes with (coarse or flaked) sea salt. 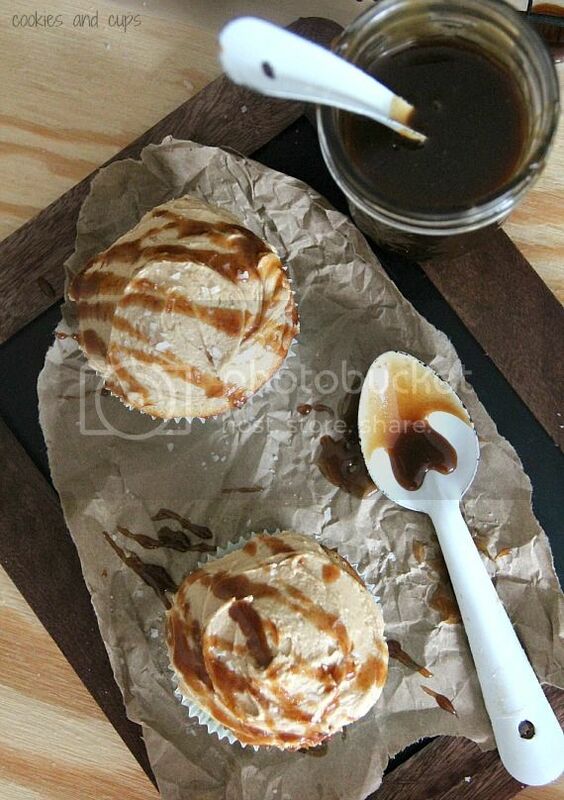 and these Salted Caramel Cupcakes from Tidy Mom made with Caramel Macchiato Coffee Creamer…such a great idea! Gosh, I’m hungry now! Really want to make those. You probably don’t NEED the different sugars, but I love dark brown sugar, but wanted to balance it out slightly with the white. I don’t think a cupcake can be more gorgeous! Those are seriouslly the most beautiful looking cupcakes. I love salted caramel on anything! Ooh, I like the poking a hole in the cupcake to let the caramel soak in part! You’ve swooned me again, Shelly. Probably more times than my own boyfriend has, but that’s besides the point. I’m OB.SESSED with caramel sauce and sweet + salty is my jam. Homemade caramel? Now that is something I see myself face-dunking in again and again. I made some salted caramel bars last week and I just love the salty ‘n sweet combo – and these cupcakes look crazy good! I mean, with the layer of salted caramel anything is destined to be fabulous! that is one delicious looking cupcake! just look at that caramel dripping down the sides. i really like that you made the cupcake like a sponge to soak up all that goodness! And oh my goodness about the opening up the can of worms…I know your pain, believe me! Good luck!! salted caramel is one of my weaknesses! I made salted caramel krispie treats this weekend. I can’t get enough of the stuff! My favorite part about these cupcakes is that you poked holes so that the caramel could soak right in. I can imagine how incredible each bite much have been with the drippy caramel inside! Ummm, yeah, so you pretty much CANNOT go wrong with salted caramel. Good luck with the renovations and potential new furniture purchases! 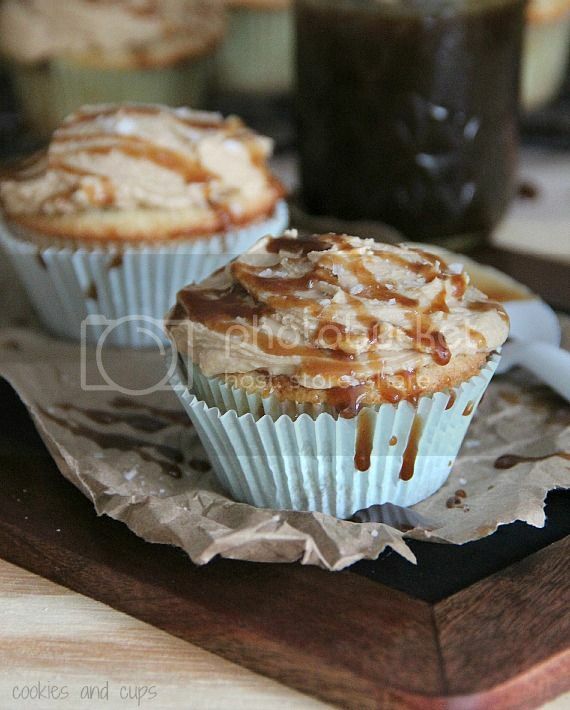 These salted caramel cupcakes are killer gorgeous, Shelly. And I’m drooling! Already pinned these babies! In love! I kinda wanna swim in the caramel sauce. Except that it would probably burn. Goodness me! What a lovely cupcake!! oh Shelley your cupcakes sound incredible !!! so I’m right there with you on wanting the whole house makeover! we are getting all new appliances, and family room flooring, and it’s making me want all new everything else! Oh wow. Salted caramel never gets old. I was already with you, and then I saw the whole poke-the-cupcake-and-let-the-caramel-soak-in thing. Oh my. see those right there, they totally count towards new furniture. Use it on hotdogs?? hahaha That’s amazing! Adore these Shelly. Salted caramel is a huge weakness of mine! Oh my! Your pics of drizzled caramel are enough to convince me to make these cupcakes. Heaven! Hot dogs with leftover caramel – now that is new 🙂 I always love your cupcakes! I hear ya’ on needing all new stuff – we just moved and it is the perfect excuse to get new furniture. Got office furniture and a new kitchen table and chairs this weekend. Already thinking of new furniture for the basement. I had my first salted caramel cupcake last week, and I am obsessed! I love this idea. I also love the idea of foolproof caramel. I have my doubts…but I trust you. I can totally see how you’d need new couches after redoing your kitchen… totally! lol 🙂 Love these cupcakes, especially the drizzle. Oh my! Love these cupcakes! Want now! These look delicious! Where do you get the flaked sea salt? At the local grocery store or a specialty store? Did anyone elses cupcake fall down? We used the fallen cupakes as a crumble cake instead and it still was awesome. Probably will use a sturdier cupcake next time tho. How odd that your cupcake fell? I have never had that problem..but glad to hear that you were able to make the best of the situation! These are so sinful! I’d love to get my hands on them. I’m pretty much in love with these. Yum! I am soooo in love with these cupcakes. You cannot beat homemade caramel sauce. It’s the best! Love that you let it soak into the cupcakes–divine! PS: Are we going to see finished kitchen pictures when it is done? These didn’t do the trick at getting the whole house makeover??? That surprises me because those are insanely good looking. And poke holes in the top for more drippy caramel to go inside…I am so there!!! Salted caramel gets me every single time!!! 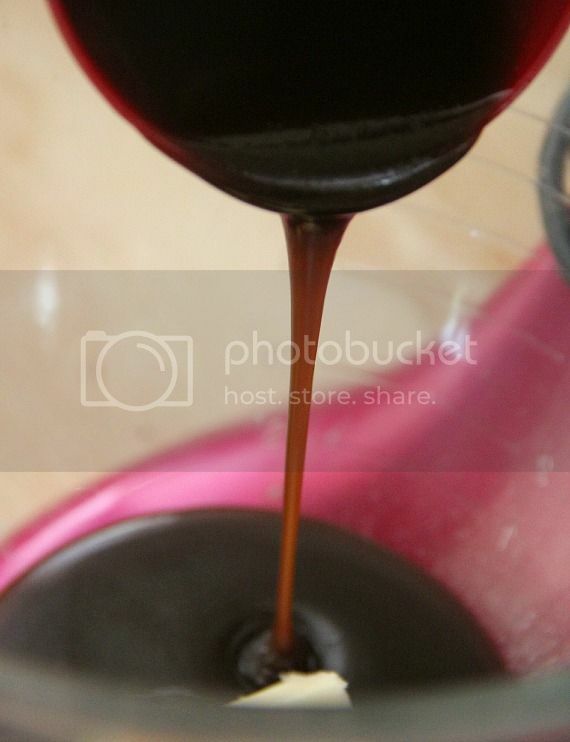 Wow, I can’t believe how easy that caramel sauce really looks! And stuffed into the cupcake and drizzled over that frosting?? Too yummy! These are STUNNING! We’ve been obsessed with caramel everything lately, so why not add cupcakes to the mix?! Bookmarked! This made me smile..My hubby gets temporary deafness too sometimes.. I think it is in the hubby handbook. I am drooling over these. I will try the caramel sauce..I was always unwrapping those buggers and it is a royal pain. Soon it will cool down and I will bake up a storm. Hubby is waiting for the oven to heat up all summer,but unless he put in airconditioning in the ktichen, it won’t happen….ha ha..Thanks! Ooh yum these cupcakes look delicious. I’d love some right now! I want to lick the paper, then the spoon and then gobble up a couple of those cupcakes, YUM! Have fun with the re-do! WOW! These sound delicious and SO easy to make! Thank you for sharing these!! This looks amazing! My sister loves Salted Caramel Cupcakes and I want to make some for her baby shower in a few days. How long will these keep? thanks for sharing! i made these yesterday (sans buttercream) and they were delish! initially, i thought the cupcakes would be a flop as they smelt eggy and looked very textured even after baking. however, they came out perfect and we would even eat it on its own. Awesome! SO glad you liked them! Thanks for the feedback! I made these for a Christmas party and they were a hit! Soooo yummy! My caramel didn’t exactly soak in as much as I would have liked, perhaps it cooled too long? Doesn’t really matter because they were delicious anyway! haha! I’m so glad you liked them!! yay! Just made these exactly following your directions and they are to die for!!! I made these with your really yummy chocolate cupcakes, and Oh. My. Goodness. These are the best thing I have ever made, or eaten. The caramel was so easy to make, and turned out delicious. After I made it, I poured it into a parchment paper lined jelly pan and stuck it in the fridge to cool down. I also added a little cream cheese to the frosting. The frosting itself tastes pretty sweet, but the chocolate cake and the sea salt help to cut the sweetness. Seriously, I want to go try everything on this blog now. If the other stuff tastes half as good as this did, I’ll be a happy lady! awww I love it! Yep, those cupcakes are some of my most favorite! I have tried this recipe twice now with SUCCESS both times! First I made them for a baby shower and I just got back from a work function where I made them for my boss and a bunch of coworkers- so many compliments. I 1.5’d the recipe and it worked great (I just made 1 1/2 cupcake dough and left the other things the same and it balances out better, i find). Anyway, I am very enthusiastic about these cupcakes. YUM! And they are SO beautiful. These look DELICIOUS! I can’t wait to try them. However, I have a question. What happens if I use lowfat milk instead of whole milk? I normally don’t have whole milk at home. Im not one to comment much on recipes. I never have actually. I am an experienced self taught cook and now working on some baking. I made these the 2 days ago and they are AWESOME!!!! ^_^ SOOOO GOOD! And so simple! It was unfortunate I only had one brown sugar but it still did the trick! Only things I changed was I used some vanilla sugar in the cakes, a tad more salt, and more vanilla (I like vanilla lol!). Great recipe!!!! After 8 years of wanting a Kitchenaid stand mixer, I FINALLY caved and purchased one – this is the first recipe I decided to try with it. Caramel sauce is made (first time ever making — who knew it was SSSOOO easy and SSSOOOO good?!?!?) and cupcakes are currently in the oven (even before being cooked, the batter is the BEST tasting batter I have tried in a LONG time!) …I’m not even caring that my kids are currently boycotting nap/quiet time, because I’m too excited to get these finished! Just, WHOA. These cupcakes looks super delicious! Can’t wait to make it! Pinned!! I just finished baking these cupcakes and they were absolutely delicious. The only small thing I added was more salt because I love how it enhances the flavour of the caramel. In all, this recipe is perfection! I halved the recipe and it gave me 10 cupcakes. ? ?